3-lbs ground lamb, 2-sun dried tomatoes, finely chopped,8-oz feta cheese, crumbled, 3-tbsp fresh basil, finely chopped, 1-tbsp fresh rosemary, finely chopped, 1-tbsp minced garlic, 1-tsp salt,1/2-tsp freshly ground black pepper. Combine all ingredients, mix well & stuff into hog casing. I had expected more lamb with rosemary and maybe mint sauce! Maybe even some peas and mash thrown in for good measure. I might have to have a crack at that, doesn’t sound too bad. I quite liked the sound of the combination though, so on we went. My deboned lamb weighed in at 2.1 kilos so I adapted the quantities of the other ingredients (roughly) to suit that meat total. First up was to debone the leg of lamb, quite easily done by following along the bone with a sharp knife and because it’s sausages, you don’t have to be too neat. 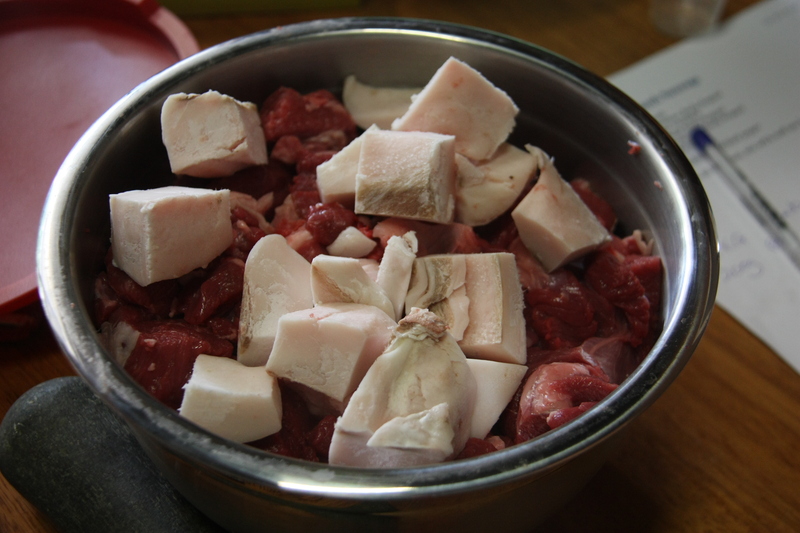 Meat was cut into portions about an inch (2.5cm) square. I added some pork fat (10%) as the leg meat was so lean. 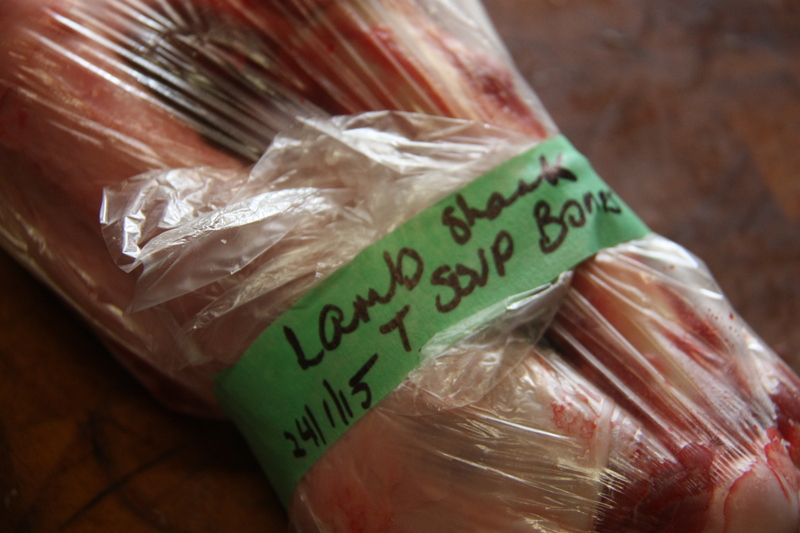 The shank and the bones I removed are going into the freezer for another day. I’ve changed the way I label things in the freezer, I never can seem to be able to read what I’ve labelled so now I wrap some reno tape around the parcel and mark it nice and big. God, I hope that doesn’t mean I have to start borrowing large print books at the library! 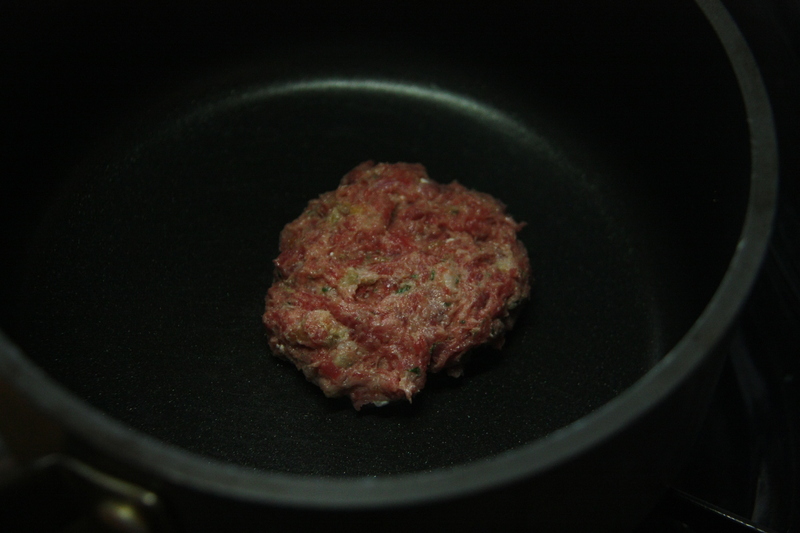 The meat, feta and herbs were fed through the mincer, a small pattie was cooked to check for flavours and seasoning. We added some extra pepper but everything else seemed ok.
Next was to stuff the mix into sausage casings. We used the ‘stuffer’ we bought after our visit to Tasmania last year. 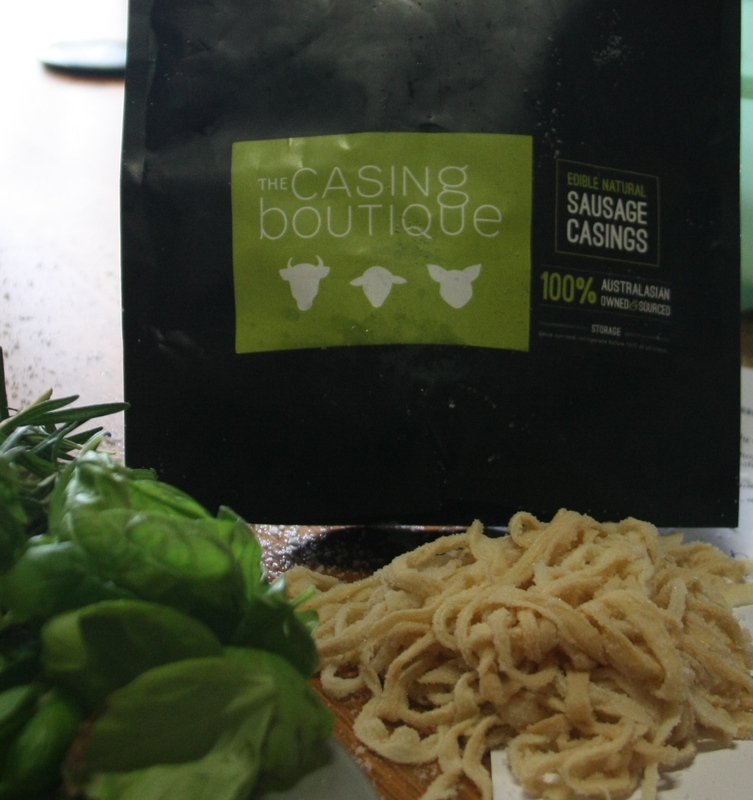 It makes a job so much easier when you have the right equipment.I buy our sausage casings online from The Casing Boutique. They sell quality, natural casings and have been super quick with delivery, these ones are hog casings. The hardest part about the whole process is getting the casings onto the stuffer! All done! 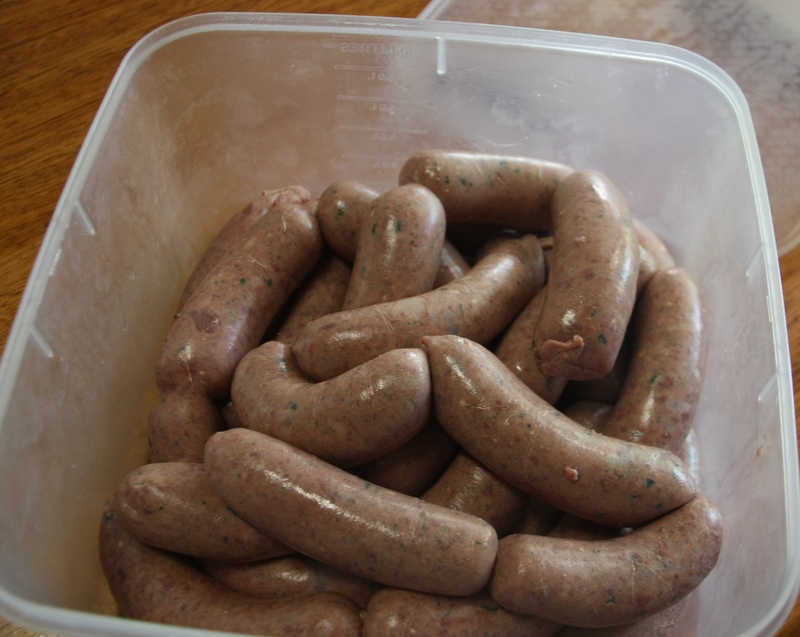 We now have a nice big batch of “Aussie Lamb Sausages” ready to hit the BBQ on Monday. I quite like the fact these sausages include ingredients representing a few different nationalities and cultures. After all, that is part of what has made Australia such a diverse, exciting and wonderful place to live! This entry was posted in Recipes, Uncategorized and tagged Australia day, butterflied leg lamb, deboning leg lamb, lamb recipe, lamb sausages, Making sausages, sausage casings, The Casing Boutique. Bookmark the permalink. 1 Response to AUSSIE SNAGS…..
Oh. Yum. They sound delicious!